So you want to add a new carrier to Freightview. That’s great! We’ve made the process of adding a new carrier/broker quick, easy, and free. First, log in to your Freightview account and select the “+” to the right of the Carrier/Broker banner on the right hand side of the page. 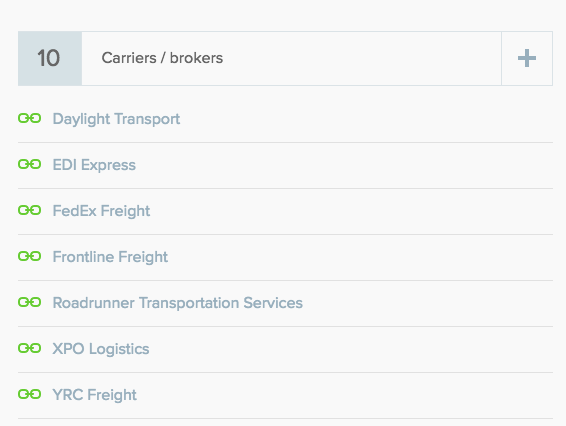 Freightview is currently synced with approximately 70 carriers/brokers. So while you can certainly scroll down the list if necessary, we do provide a search bar to assist in finding the carrier/broker you’re looking for. Once you select the provider you'd like to add, we may ask for additional information that will help us identify your carrier account. Click “authorize” to add the carrier. This will prompt us to start connecting with your rates. This indicates that we’re working to add this carrier/broker, but they have not been implemented on our system yet. If you see this, please keep them on your profile! We prioritize the carriers/brokers we connect with based on the number of requests we receive to add that carrier. The more requests we receive, the sooner we'll work on getting them live on our platform. Once we have successfully connected to your carrier, you'll receive an email letting you know! You can also easily remove a carrier or broker from your Freightview profile. To do this, go to your Freightview landing page. You should see your list of carriers/brokers directly underneath this button. Select the provider you need to disconnect, then you should be given the option to remove that carrier or broker from your profile.